Philip Pullman’s latest missal, La Belle Sauvage, once again features the boat-dwelling Gyptians. Rough and honourable, they emerge from the waterways of Brytain to help the heroine Lyra, before disappearing back to their watery world, one that runs through Lyra’s, but is separate and different from it. After a long weekend on the canals in the heart of Britain, I feel I have been drifting in Pullman’s wake. ‘Just steer her in here,’ says the boatman. We are new to the canals, so he is taking us through the first lock. ‘Straight in’. He must be joking: only one lock gate is open. The gap is about six inches wider than the boat. But his weathered face is completely straight — and completely calm. Deep breath. We make it into the lock without damage. Our boatman disappears up the towpath, and we are alone on the canal. First we have to slow down. 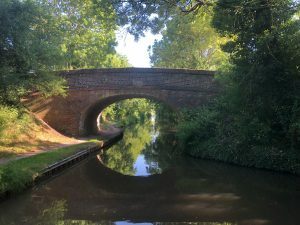 Having boarded our smart green-painted narrowboat at Kate Boats on the outskirts of Birmingham, our route hugs that of HS2. The train will soon whizz passengers to London in 49 minutes. By boat, it would take us a fortnight. Fortunately, there is something meditative about steering gently along a narrow channel flanked with hedgerows. Locks, of course, are not meditative. But they are satisfying. They are everything the digital age is not: physical, controllable, perfectly designed technology… and unchanging. It is easy to imagine the 19th-century families whose lives were lived on the canals. And the canal equivalent of Land Girls — the so-called Idle Women, unfairly named for their IW (Inland Waterways) badges — who 75 years ago hauled open these same lock gates. Usefully unnoticed, they dragged 50-tonne loads along this wartime lifeline between Birmingham and London. Though it’s half a century since the last working boat passed this way, the Inland Waterways still have their own camaraderie. We are taught the unwritten rules by the boat ahead which waits for us to slip (or bump) in beside it at lock after lock (ensuring water is never wasted by unnecessary openings). We in turn teach the newbies behind us. And everyone takes their turn at the windlass. The ways of the water are quickly entrenched so a single failure to co-operate by another boat jars terribly. We wave, get steering tips (you have no control when reversing), play boat-to-boat catch (and canal-to-boathook retrieval), share tree-fresh apples from a lock-side ‘help yourself’ box, race (at a daring 5 mph), and chat as we rise or fall between close stone walls. There are constant stories: the ferret-owning barefoot boatie; the ancient canal-side drovers road; the giant reptiles that once roamed the region — now fossilised in the blue lias limestone through which the Stockton Locks are cut. We are quickly absorbed into canal life — more so than we realise until we are jolted back into the terrestrial world. Leaving the boat, we cut through the hedgerow and up a mud path to find ourselves on a six-lane road bridge. I stand shocked, like a newly landed alien, as cars blast past, horns hoot, traffic lights flash. How did we not know? All this, just feet from our parallel world wending its peaceful way through an oblivious Britain — or Brytain.